The ADDIE (analysis, design, development, implementation, and evaluation) process remains the dominant instructional model. Yet, it is not the optimal process for the design of e-learning. It neither takes advantage of the technology underlying e-learning nor produces the kind of creative and effective learning experiences we need. What is the alternative? Rapid Prototyping: the method now employed by most experienced designers. 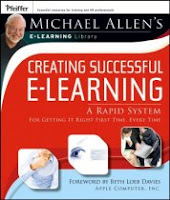 In this book, one of six in Michael Allen's Online Learning Library, Allen shows how rapid prototyping methodology--using successive cycles of analysis/evaluation, design, and development--can bring tremendous cost, efficiency and creative benefits to e-learning. Michael W. Allen pioneered multimedia learning technologies, interactive instructional paradigms, and rapid-prototyping processes, bringing each forward into leading corporate enterprises. He is the chairman and CEO of Allen Interactions Inc. that builds universally acclaimed custom e-learning, provides strategic learning consulting, and trains e-learning professionals in collaboration with ASTD.